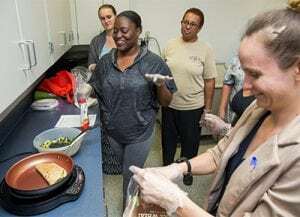 In the kitchen at UF HealthStreet in Gainesville, Fla., a small group of enthusiastic adults meets weekly to cook together and learn to eat healthier. Each class begins with a discussion about nutrition and time to share their experiences with one another before the cooking begins. The UF/IFAS Extension Family Nutrition Program (FNP) provides the free six-week series to help SNAP (formerly Food Stamps)-eligible participants learn how to prepare healthy meals on a limited budget. UF HealthStreet is an innovative community engagement program at the University of Florida that improves the health of our community by bridging gaps in health care and health research.